Most residential building wiring circuits use 3 colors of wire. They are white, black, and green. The black is for the AC hot side of the circuit and white is for the neutral side of the circuit, which is usually connected to the earth ground of the building also. The ground wire is colored green and it usually gets bonded with a copper strap to the copper pipe that feeds the cold water to the building from the city water supply. That is why it is called the earth ground, because it really touches the earth. Why this type of electrical connection is needed is a whole other subject unto itself, but the bottom line is that a good ground protects you and your family members from stray electric shocks. There are 2 components to electricity. They are the voltage and the current. In an analogy to water think of voltage as the pressure and current as the quantity. 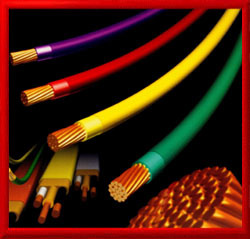 Wires for high voltage have very thick insulation to keep the voltage contained, and wires for high current have very large diameters to be able to handle the quantity without overheating from insufficient capacity. Both these components play a key role in powering electrical devices. Voltage is measured in a unit called Volts and the higher the voltage the smaller size you can build an electrical consuming device such as an AC motor. The higher the current a device uses the more power a device has to do physical work. Current is measured in Amps. A person may be able to reach out and grab the output shaft of a motor that uses 0.5 Amps and bring it to a stop, while if they tried that with a 500 Amp motor they would definitely lose their hand. When you flip a switch on in your house electric current flows from the Black AC hot line through the device to be powered such as an appliance or light fixture. Once the current passes out of the consuming device such as the electric motor in the appliance or filament in the lamp, it then passes on into the white line or wire, which is the neutral side of the circuit. The Black and the White wires can never be connected directly together. This is a short circuit and is very dangerous. The reason that it is called a short circuit is because the electricity is taking the shortest path from the hot to the neutral side of the circuit. Because the 2 sides of the circuit touch each other directly the path through all the current consuming devices on the line is bypassed as the electricity travels through the SHORT circuit. Short circuits can result in violent sparking, burning or even explosions and fires, so you don't want this type of defect. Some electricity consuming devices do short out when they wear out or get old, by short that means the guts of the worn out device transform or disfigure in such a way as to form a solid connection between the hot and neutral side of the circuit as if it is a solid bar of copper across the 2 sides of the circuit. This causes the current in the circuit to rise. Usually circuit breakers or fuses in the line detect this condition and open up to protect the wiring. Without this protection the wiring inside the walls of the house might start melting and sparking and trigger a house fire. The electric energy from the black wire must always flow through some energy-consuming device first before it goes to the neutral side of the circuit. What causes electricity to flow in a circuit is a difference in potential. The black wire has 110 volts AC on the end of it. The white wire has zero volts. The 110 Volts wants to flow to zero volts. By putting a motor or a lamp between the black and the white wires all the current and voltage coming out of the black wire gets consumed and the difference in potential between the 2 lines upon exiting the electricity consuming device gets safely reduced to zero volts as it flows into the neutral side of the circuit. Think of a water wheel positioned under a waterfall. When the water first falls on the wheel the high weight force of the water causes the wheel to turn, but as the wheel rotates down 180 degrees all the energy in the water is consumed and falls free into the pond below to mix in freely with all the water on the bottom which has zero weight force behind it as so does the water exiting the buckets of the wheel on the bottom. That's pretty much it! Pretty simple, but read some books before you get started. There is a little more to it than the above. Unless you are a seasoned pro always work with the power off. I have been wiring complex machines since I was 18 years old so the electrics have always been the easy part of a project for me. The thing about building wiring is that it should be done neatly and in accordance with the local electric code. No one has ever been hurt or electrocuted by any building, machine, electric system, or apparatus I have built to date. I am very proud of this fact.